Yellow fever mosquitoes (Aedes aegypti or Stegomyia aegypti) are widespread throughout the tropical and subtropical regions of the world. Yellow fever mosquitoes are considered the vectors for diseases like chikungunya fever, dengue fever, and Zika. The yellow fever mosquito, or Egyptian tiger mosquito (colloquial in some regions also called dengue mosquito), is widespread throughout the tropical and subtropical regions of the world. The species was once abundant in southern Europe, but disappeared after the 1950s. There are two main reasons: Firstly, the development of a communal water supply and better sanitation diminished the number of breeding sites. Secondly, the intensive use of the insecticide DDT against malaria mosquitoes also killed off Aedes aegypti mosquitoes. 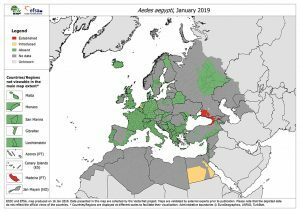 Today, there are only occasional reports of Aedes aegypti in Europe. A detailed distribution of Aedes aegypti in Europe (as of October 2016) is shown on the right side. The map shows the current known distribution of Aedes albopictus in Europe at ‘regional’ administrative level (NUTS3). The map is provided and was developed by ECDC/VBORNET (European Centre for Desease Prevention and Control), and is based only on confirmed data (published and unpublished) provided by experts from the respective countries as part of the VectorNet project. An estimated range of Aedes aegypti in the United States, 2016, is shown on the right, provided by the CDC (Centers of Disease Control and Prevention). Maps have been updated from a variety of sources. 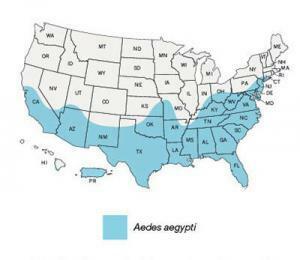 These maps represent CDC’s best estimate of the potential range of Aedes aegypti and Aedes albopictus in the United States. Maps are not meant to represent risk for spread of disease. 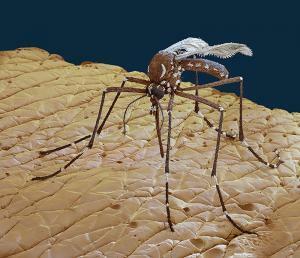 The dark-colored yellow fever mosquito is about 3-4 mm long. The mosquito can be identified by a marking in the form of a lyre on the dorsal side of the thorax, and striking white and black patterns on the legs. 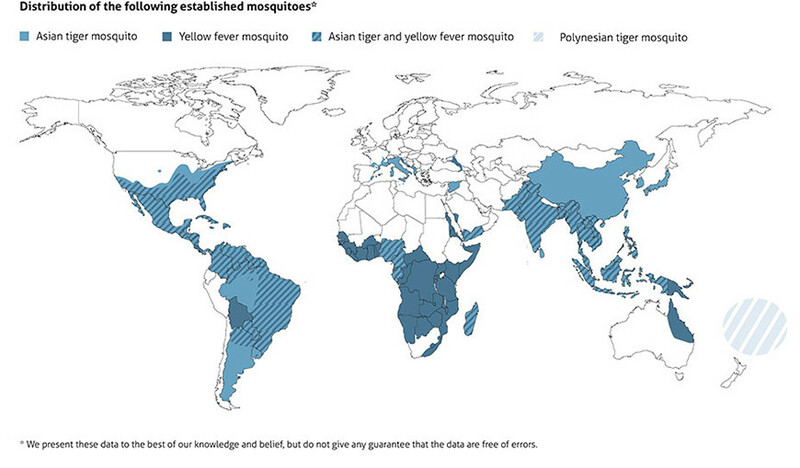 The yellow fever mosquito breeds in close proximity to humans in habitats to those used by the Asian tiger mosquito. These include: water-filled flower pots, vases, buckets, water barrels, rain gutters, discarded cups and bottles, plants that hold small quantities of water, or any other containers. 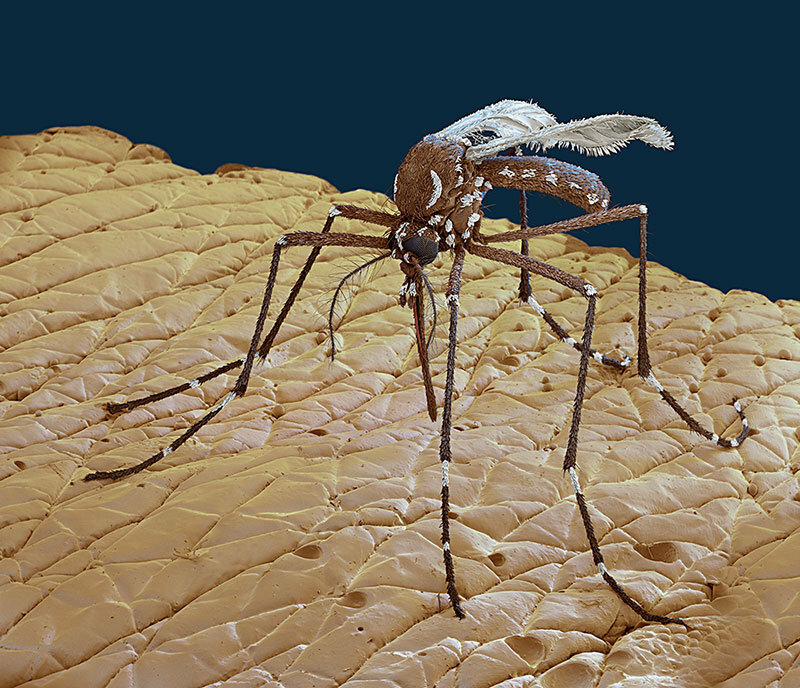 The yellow fever mosquito is also an aggressive and persistent day biter that prefers to feed on human beings. Yellow fever mosquitoes regularly enter houses looking for hosts or places to rest. 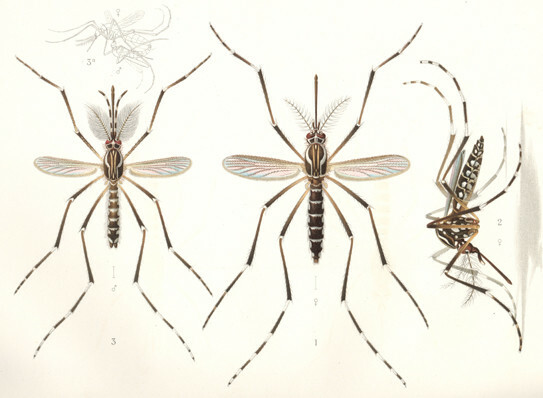 The life cycles of the yellow fever mosquito and the Asian tiger mosquito are very similar. The eggs are resistant to heat and dryness, and are deposited in natural and artificial containers subject to flooding. 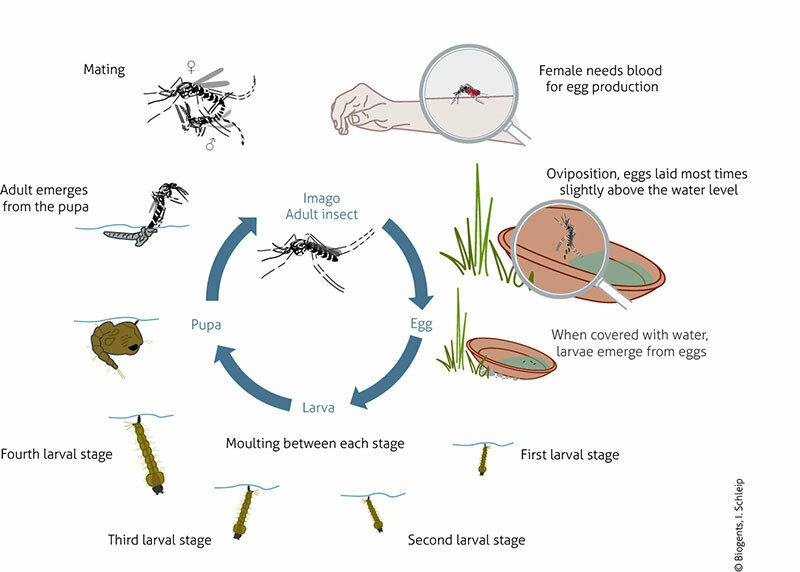 When eggs are covered by water, the larvae hatch,hang at the surface of the water, and breathe through a snorkel-like siphon at the tip of the abdomen. There are four larval stages that feed on organic material that they filter out of the water with their mouthparts. The fourth-stage larva changes into a pupa, that hangs at the surface of the water, and breathes air through two snorkel-like siphons at the front end. The pupa is a non-feeding stage where the mosquito changes from the larval form into an adult insect, or imago. The adult mosquito emerges from the pupa, and normally feeds on sweet plant juices and nectar to meet their energy requirement. Only female mosquitoes feed on blood, which they need to produce their eggs. What diseases do the yellow fever mosquitoes transmit? The yellow fever mosquito is not only the main vector of yellow fever, but also of dengue fever and Zika fever. It is also known to transmit a disease called chikungunya.